I am amazed and thankful that so many MCC congregations have already become 2011 Pacesetters — churches that are “setting the pace” for MCC’s international work by receiving an Easter Offering for Global Ministries. always rise to the occasion with generosity! If your church has not yet responded, I invite you to do so today by writing to me and letting me know of your plans. And when you write, we’ll add the name of your church and your pastor to the list of 2011’s MCC Pacesetter Churches. — MCC’s ministry into Russia, including re-publishing the first booklet in the Russian language dealing with homosexuality and the Bible, theology and human rights issues as well as sponsorship of Russia’s first-ever LGBT Christian Conference. Over the next three weeks, I’ll be sharing details with you about each of these important projects. Today, I want to let you know how your church’s Easter Offerings for Global Ministries will touch lives in Asia. 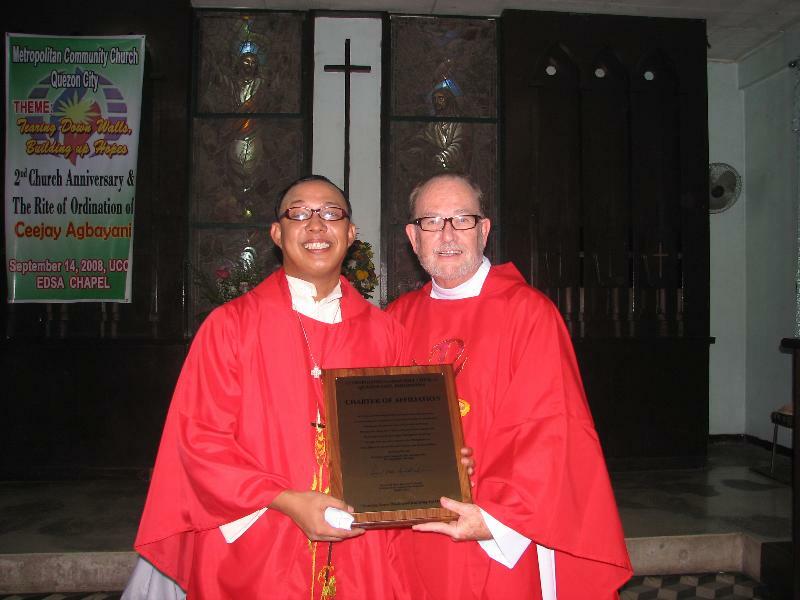 This past year, MCC held our first-ever REVM clergy event in the Philippines. Through MCC’s Easter Offerings for Global Ministries, we have a wonderful opportunity to build on the success of that event and to support our sisters and brothers in the Philippines. — 1. These funds will help underwrite API’s 2011 “October Philippine Initiative.” Rev. Elder Ken Martin will be on-site with our churches, members, and leaders in the Philippines for the entire month of October. Rev. Stedney Philips, Barbara Crabtree, Rev. Ed Paul and Rev. Karl Hand will also be ministering on-site for part of the month. API members will offer leadership development events throughout the month of October, including programs on “Local Church Infrastructure and Board Development” and “Developing a Strategy for the Future.” A REVM Follow-up will take place, MAP evaluations will be offered, and courses will be taught in “MCC Polity” and “Sexuality Studies.” Interspersed with these learning opportunities will be planning sessions for 2012’s conference. — 2. Your Easter Offerings for Global Ministries will become part of the vital start-up funds for MCC’s “All-Asia Christian Conference” to take place in 2012. — 3. A portion of this year’s Easter funds will help support the pastor’s stipend and building subsidy for MCC Quezon City during 2011. — 4. Finally, if we exceed our target of raising $30,000 USD through MCC’s Easter Offerings for Global Ministries, the API has set an “over and above” goal of using some of these monies for Elder Martin to conduct a ministry trip from Manila to Kuala Lumpur during October. MCC churches and ministries are exploding across the Philippines! Did you know that, to date, all funding for these efforts has been raised entirely by donors? Now our local churches have the opportunity to support MCC’s anchor efforts in Asia through this year’s Easter Offerings campaign. 4. Look for more news and details — along with resources, photos, promotional materials, congregational prayers and bulletin inserts — coming very soon! The first miracle… is that God will use these combined gifts to launch new ministries, strengthen our churches and touch the lives of MCCers around the globe. Together, we can accomplish what none of us could do alone. The second miracle… is that as we join hands with other MCC congregations in this shared ministry and shared vision, our fellowship with one another will grow deeper and stronger, and that is beautiful. I hope you’ll write me and let me know that your church will be part of the miracles that take place through MCC’s Easter Offerings for Global Ministries! P.S. Remember, when you write to me and let me know of your church’s participation in MCC’s denominational Easter Offering, we’ll promptly add you to the list of 2011 Pacesetter Churches that are leading the way in support of MCC’s global ministries.